How long ago was I in Iceland? Good grief, 2011. On how many trips do you find a manuscript lace chart in a pile of old books? That's a day you never forget, unless you're me. Then you forget about it for three years. 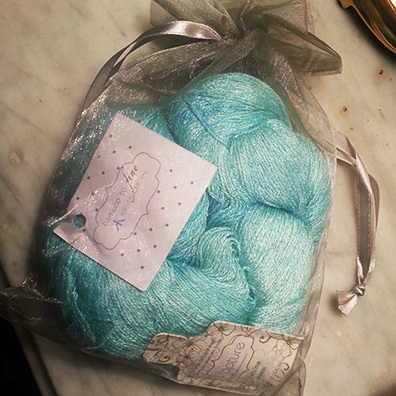 When Kristin Omdahl sent me some of her Bamboo So Fine yarn, I remembered. Have you had a chance to handle this stuff? It's seriously groovy. 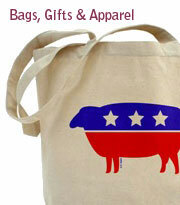 All bamboo, spun and dyed in America. Fabulous drape, soft as soft gets, and the sheen is such that people keep asking me if it's silk. I hadn't been this excited by a lace weight in a long time. It needed to be knit. When I went to the shelf in search of a test pattern, lookee what fell out of one of the books I bought in Reykjavik. I took it as a sign. Now, a few things about this chart. First, it's tiny. The squares on the graph paper are 20 (TWENTY) to the inch. Take a moment and admire how perfectly those symbols have been drawn. Each one's about the size of a midge. Also, it's written in German. My German is meager, to put it mildly. Most of it comes from time spent working as a drama coach for opera singers, and operatic German has a limited vocabulary. You get oaths of vengeance, declarations of love, and overheated exclamations of rapture in the face of all-consuming beauty. None of this is helpful when deciphering a lace chart. Happily, I have a knitter friend, Karen, who speaks German and offered to translate for me. There were no big surprises, except that the lengthy chart key includes explanations for about eleven symbols that aren't in the chart. With the translation in hand and the chart blown up to accommodate my rapidly aging eyes, it was time to try out "Laura Star" and see what I'd get. Would it work? If you've never tried one of these little doilies, this is a good starter. The piece is small, the progression is logical, and if you pay a reasonable amount of attention you'll have a dandy time. There was one more surprise, which sharp-eyed readers will already have spotted; but which I didn't notice until I sat down to write this entry. "Laura" isn't the chart I found when I first went through the sheaf of books and loose papers from Reykjavik. It's not the one in the picture from 2011. There's another manuscript chart in there waiting to be translated and tested. Um...Karen? May I have a moment of your time? Meanwhile, have a whack at Laura. Here's the chart, modernized for your knitting pleasure. It's big, yes–so save it to your own computer or tablet or whatever you kids are using these days. It's free for non-commerical purposes. You're like the Encyclopedia Brown of knitting! That is seriously gorgeous. I have downloaded the pattern, and think I will dig through my stash till I find that cached Cascade Epiphany I've got stored somewhere. It deserves a beautiful yarn. With that said, I think this may make a good tablecloth for my little side tables (they're octogon-shaped). Thanks for catching that, Renee Anne - actually the issue was that round 5 is one of those near the beginning that is uncharted, and knit around. I've corrected the file. Wow, fascinating! Love that yarn, too. So very tempting. If you have Kunst-Stricken edited by Marie Niedner and Gussi von Reden, I think this might be "Decken Laura", no. 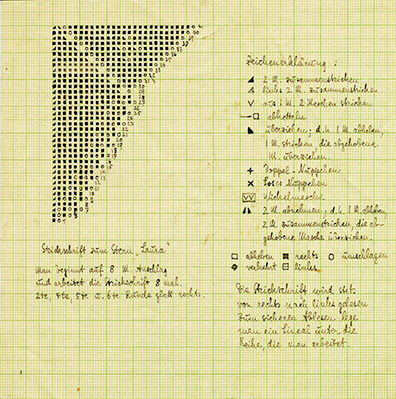 109, p. 30, chart 60 (p.67). 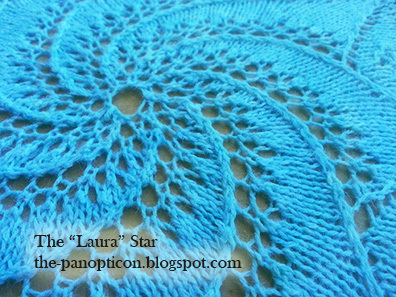 I haven't checked it stitch for stitch, but the chart and the swirl look very similar. Gorgeous. I feel like at a blown-up gauge this could be the next Hemlock Ring blanket. Is there a legend of the symbols? @gail Simply click on the image. This takes you to the full pattern, stitch key included. Franklin, this is such an amazing tale. I love the notion of defrosting cryogenically frozen knitting patterns. Tapping into such an age-old tradition and craft is one of my favourite parts of this hobby. And the 20/inch symbols are seriously impressive! Thank you (and Karen!) for breathing life into this one again. And congratulations on becoming a discount code! Truly a mark of any modern man of import. I love your story and your (and Karen's!) generosity. The description of German opera made me laugh! This is beautiful! (but I hate to knit lace.) But this is BEAUTIFUL! (But I hate to knit lace) But this is beautiful and there's that red linen and think Christmas. (but it's lace) But red linen for Christmas . . . 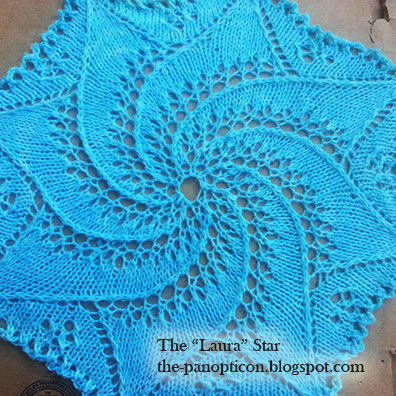 I love this pattern, and love lace, but don't love doilies. 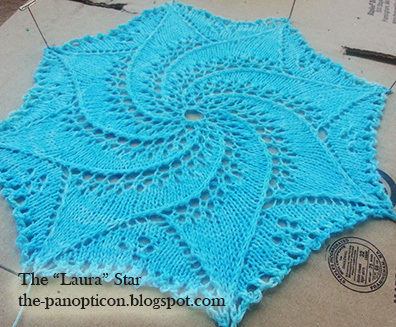 I am trying to think how it could be modified. . . . Semi-circle shawl? Pillow? Hmmm. . . This is lovely! 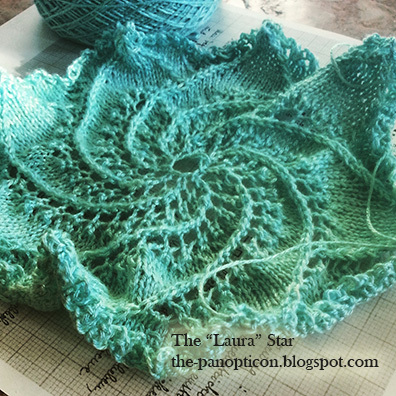 Perfect for beginning lace. Now to find something to be able to practice that German exclaiming rapture in the face of all-consuming beauty. Franklin, in my screen the chart is cut off at the side. How do I get the whole thing? Oh, this fills me with wonder. I am jealous of your endeavors and wish I could convince myself to make time to do knitting research and discovery like this. I've never wanted a doily... until now. Thank you Franklin! Just the knitting inspiration I was needing -- my mojo has been in the toilet lately. GREAT story but then all your stories are great! I always look forward to your blog. A class with you is at the top of my bucket list. Have a lovely day. This is really gorgeous. Is there a way to make this into a full size shawl? Perhaps keep going on the spirals and do the edging at the end? I love this little blast from the past. I might be confused, though. Does it block to an octagon or a square? Blue, it's an octagon - the first shot up there of the piece blocking shows all of it, edge to edge. It's always a pleasure to see a new post from you. This one is especially nice, for the pattern included. I have some silk-blend lace weight in the stash that's just been waiting for nifty antique pattern. Thanks! 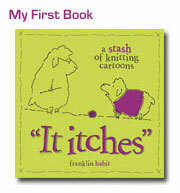 Wheee, Got just the yarn waiting for this! Thank you so much for sharing it! I know what I will be doing today. It's a gorgeous pattern, but I'm not sure it will scale up past the final round in the chart. If you look carefully you'll notice that the two lines drawn by the pattern stitch come together in the last row. We would have to knit on so that they either cross or continue in parallel to see what would happen to the spiral. It is certainly worth the experiment: just place a lifeline after row 41 and then see what happens as you keep knitting on. -- Lulabellebird on Rav. Easily scaled up. At round 29 continue in pattern, remembering that you will also be extending the points by two rows for each pair you add to the swirl. MMario's plan is exactly what I'd try - continue the swirl for the desired distance, when work the points - which will also have grown much larger. That would mean figuring out what, if anything, to put into the enlarged points. The chart as written has one quatrefoil in each, so it could be more of those. However, I'd probably re-design the quatrefoil as the motif as it is gives an oddly ineffective result (IMHO). That's one of my favourite sources for knit doilies. Can you tell me where you corrected the file regarding Row 5? How big is this piece finished and blocked? Just to be super picky what needle size did you use? Dear Franklin's Eyesight and Posture, Thank you for the pains and stresses you went through to assist in the fulfillment of this wonderful, worldly story. You'll get your rest in due time. However, until then, stick with him, mates! He's inspiring us! "oaths of vengeance, declarations of love, and overheated exclamations of rapture in the face of all-consuming beauty"
This is the exact same cross-section of my Italian, plus a bit more quotidien vocabulary thanks to my knowledge of French and Spanish. And for the same reason. I can't ask directions to someplace in Rome, but I would be able to ask, should I be thunderstruck by the beauty of an Egyptian queen, whether or not in a flood of light, the gods had descended to Earth. Please check all your posts for comments from non-English language! They are adverts for herbal remedies for sexually transmitted diseases (with extremely explicit photos) Not what people wish to see, I'm sure. what of your readers click on these, thinking they might be links to knitting sites? How many stitches did you cast on to get the piece you ended up with? and are we knitting from the inside out? Speaking of Iceland, whatever happened to that beautiful Iceland Sky Knitted Shawl? In April, 2012, you blogged about it, showed pictures, and said you had sent the pattern to the editor. But I can't find any other mention of it or any place to buy the pattern. Is it available?? Great fun and a good way to spend flights to and from Chicago last week. Took only a bit of grounded delay more than the flight time. Aww, it's named after me! That really is the most beautiful colour! That is gorgeous! I will definitely try my hand at that- I am drawn to vintage and antique patterns and may be a bit of an old soul. I always look forward to your posts here and your article in Knitty (I am actually am 3/4 done with the Victorian Baby Ensemble from Knitty) Thank you for your wonderful patterns!!! Actually "Lauras Stern" is a very popular children story and tv show in Germany. The star always helps her, when she gets in trouble. And I'm definitivly going to knit this pattern! Germans are crazy industrious and have fantastic contributions to the world of music, but their language is nuts. wow, great news. Thank you so much for your information. thanks admin has presented useful information and news which , hopefully with a frequently updated website will make it even harder for the visitors .. I love Laura! What a beautiful shawl! And bamboo yarn is gorgeous, I have a little of it in my stash but definitely want to get more. Going to check out the shop you mentioned. I found the link to your blog at the end of the very funny article you wrote for Lion Brand and will be looking back through your previous blogs now, I can't get enough of knitting blogs! Congratulations have been nice job. Hello - en lieu of some jocular quip as to the extended time between your blog posts, I plead.... Your on-line presence is valuable to your readers who have access to your views and musings here or on Knitty only. And Knitty would appear to be winding down. So, how is the spinning and design work going? Just sign me, "A Fan". Obrigado sinceramente por compartilhar o que sabe e ser você mesmo. quando o tratamento desses dados for efectuado por um profissional de saúde obrigado ao sigilo profissional ou por outra pessoa igualmente sujeita a uma obrigação de sigilo equivalente. That is gorgeous. I have downloaded the pattern, and think I will dig through my stash till I find that cached Cascade Epiphany I've got stored somewhere. It deserves a beautiful yarn. I am a China travel lover, these may help you for travel: China group packages, Beijing city tours, Xian Travel Service. Today I 've been online from the morning , try to find information from everywhere , it turns out here the place . Hello, I love your crochet, it is beauty, I love this colors, I follow your blog, I have a blog about crochet and knit with free patterns and free crochet, knits diagrams, visit me , hugs from Brazil. I couldn't find a place to just message you so I'm going to comment on here on your latest blog post. 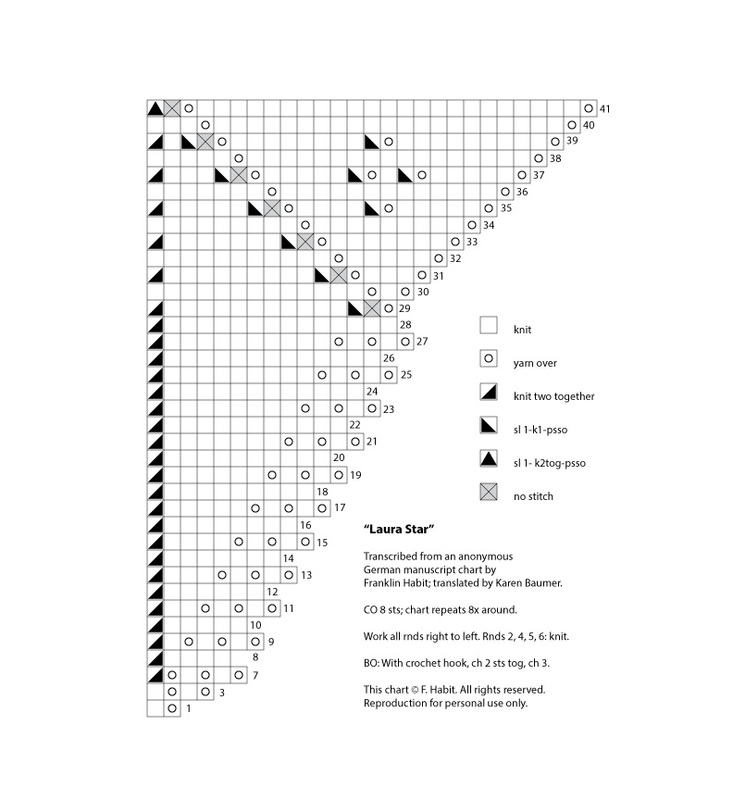 My question is this, I recently just got the e-copy of "My Knitting Book" by Francis Lambert and liked the way that the rose-leaf pattern sounded, I haven't tried it yet though because I don't understand what "bring thread forward, knit one; bring thread forward knit two;" translates to the modern knit brain as. If you could please, ever so kindly explain this to me I would be grateful to you. See you at SAFF! I'll have my lace sampler with me for you to fondle. thanks for all your knitting goodness. Interestingly, and I want to leave a trail by commenting here . That is really gorgeous! And I love that yarn. Very tempting. Thanks for sharing! Good site! I really love how it is simple on my eyes and the data are well written. I am wondering how I could be notified whenever a new post has been made. I keep the spirit to strive to be the best, one of which is a reference from your idea that really helped me. Once again I want to say thank you.. Which can indeed learn from the internet saja.Media easiest way to seek knowledge . cool , sophisticated technology is currently growing rapidly || Cobalah untuk lebih konsisten lagi dalam menjaga kesehatan tubuh anda.. kesehatan pada ginjal terutamanya, Anda harus tau cara membersihkan ginjal yang benar dan aman, ginjal yang sehat adalah jalan terbaik untuk mendapatkan cara agar cepat hamil .. namun dibalik semua itu Anda juga harus hati-hati terhadap penyakit menular seksual, maka harus tau ciri-ciri penyakit sipilis dan harus tau juga bagai mana cara mengobati nya, informasi mengenai obat sipilis herbal adalah sangat penting sekali.. sekalian juga harus tau trik penambah sperma pria untuk lebih cepat mendapatkan anak..
Terima kasih banyak atas informasi yang telah disajikan senang bisa berkunjung dan di tunggu artikel terbarunya. Thank's.. semoga ini bisa bermanfaat, alternatif aman pengobatan gagal ginjal kronis. biasanya orang tua selalu bingung karena anaknya susah makan, maka harus mencari obat penambah nafsu makan anak atau bisa juga dengan suplemen penambah nafsu makan anak dan itu adalah salah satu cara untuk cara membuat badan lebih berisi makan makanan yang tidak teratur dapat memicu penyakit, harus antisipasi dengan obat diabetes herbal .. Such a nice post ! great love to read this one. What to wear with long sleeve black lace dress? Just found wedgie and I want to make it. but I am a german... I read, that you also teach knitting... what about eTutorials? Have you got some...? It would be so great! Telah hadir jelly gamat terbaru bernama QnC Jelly Gamat dengan khasiat dan manfaat lebih dahsyat dan dapatkan informasi seputar Cara Pemesanan Jelly Gamat QnC, Harga Jelly Gamat QnC, Cara Konsumsi Jelly Gamat QnC, hanya di halaman blog kami ini. Are you ever coming back to your blog????? Batuk berdarah atau yang disebut juga dengan hemoptisis merupakan gejala yang ditimbulkan oleh beberapa faktor, apakah itu karena faktor serius ataupun tidak. Ketahui penyebab batuk berdarah supaya tidak salah kaprah. Nutrisi untuk penyakit stroke ini dapat membantu mempertahankan kondisi kesehatan serta membantu pemulihan pasien pasca serangan stroke. He's never coming back, is he? Very good solution and secure to cope with kidney disease you without washing the blood that requires biyaya expensive for that we would recommend an herbal remedy ace maxs to overcome kidney failure without dialysis. Thanks for the information very interesting I really liked all the writing you. Lunch friend .. where the latest updates ?? page that is very extraordinarily pleased to be visiting your page, I found your blog on google. you added some great images or videos to give your posts more, "pop"! .. Good, i like.. It's my web. Membahas tentang bagaimana caranya untuk mempertahankan keutuhan harmonisnya rumah tangga dengan cara menjaga performa pria tetap terjaga. Salah satunya adalah menambah keperkasan dan memberi solusi obat penambah sperma pria yang aman serta memberikan hasil yang memuaskan. semoga ini bisa bermanfaat. Cara Menurunkan Berat Badan Dengan Berolahraga Berenang Sports anything that can be done by any one of them is swimming. Simple and fun sport this one turns out to burn calories in a very large number if done regularly. Ciri-ciri Kanker Payudara Stadium Pertama Pada Wanita Getting to know the characteristics of breast cancer is one of the important things that should be known by all women. Gejala Dan Penyebab Penyakit Diabetes Diabetes prior definition or understanding of diabetes, symptoms or causes of diabetes, causes of diabetes and symptoms of diabetes. Artikel yang sangat menarik dan enak dibaca ..
Nutrisi Kanker Paru – Paru Lung cancer has the dual function of spreading oxygen into the blood when breathed in and disposing of carbon dioxide exhaled. Tanaman Obat Untuk Pelangsing Tubuh currently in great demand by men or women. Has the ideal body shape is the desire of everyone.